Find latest Royal Sporting House’s promotions and warehouse sales here! 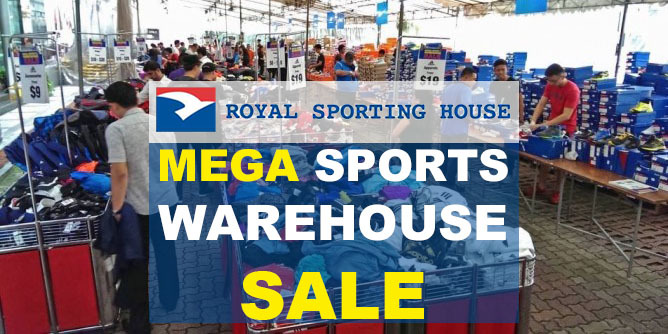 Royal Sporting House Mega Warehouse Sale is back! Enjoy up to 80% OFF brands such as Nike, Reebok, Adidas, Speedo, Saucony and more. Sale period: 28 Nov to 2 Dec 2018. Gear-up on sporting goods and save up to 80% OFF in Royal Sporting House's last Mega Sports Warehouse Sale of 2015! Enjoy up to 50% Off at selected Royal Sporting House stores island-wide, excluding factory outlet stores. Royal Sporting House Sample Sale is back and for only 2 days, 28 and 29 Oct. Items going from as low as $10. Royal Sporting House is having a Mega Sports Warehouse Sale, with items up to 80% off, from 8 to 11 October 2015 at Wisma Gulab.